Each Scholastic leveled reader comes with free digital activities to reinforce reading comprehension and add to the fun! 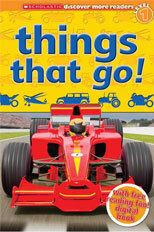 From racing cars to planes, from space rockets to trains, this Level 1 Reader is jam-packed with all the excitement of THINGS THAT GO! With high-speed visuals and key facts, beginner readers will encounter new vocabulary on this engaging topic as they start to read for information. All aboard! Find your code at the bottom of page 2 or 3 in your print book. Things That Go! unlocks a free companion digital component offering word and number quizzes to test understanding, a float-your-own-boat race, and sounds and videos for all-around fun! ¿Tienes un código? Escríbelo aquí. Meet the most adorable animals—and pet them! This book includes cute and intriguing information about sheep, goats, rabbits, guinea pigs, and even miniature ponies. Remember to wash your hands when you're done! A free downloadable digital book features fun text-based questions and activities, plus audio and video enhancements. Vetted by an editorial board including Common Core Standards experts. 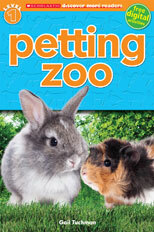 Petting Zoo unlocks free companion digital activities offering word and number quizzes to test understanding, a draw your own petting zoo activity, and sounds and videos for all-around fun! Planets guides beginning readers on a journey of exploration through the solar system, showing how planets were formed; their attraction to stars, moons, and satellites; and how we humans explore our space neighborhood—the Milky Way galaxy—and beyond. 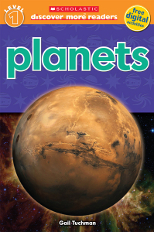 Planets unlocks free companion digital activities offering word and number quizzes to test understanding, a make your own planet family activity, and great videos for all-around fun! Learn all about the monarch butterfly, from its metamorphosis from a caterpillar to its incredible journey across the American continent! As kids follow the monarch, they will meet a host of other beautiful butterflies and find out all about butterflies' lifecycles, senses, and just why they are important to all of Planet Earth. Including key vocabulary words and infographics, children will learn to read as they develop critical thinking skills. 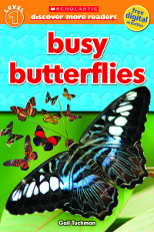 Busy Butterflies unlocks free companion digital activities that offer fun quizzes to test understanding, cool projects like painting your own paper butterflies, and amazing videos for an all-around butterfly experience! Dive into the amazing underwater world of SHARK ATTACK! 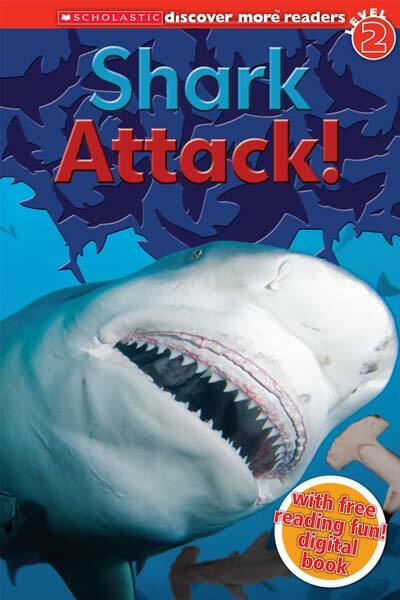 Every kid will love being scared silly by great white sharks in this Level 2 Reader. Young readers will encounter new vocabulary and information-reading features such as sequences and compare and contrast, via dramatic visuals and extreme facts. Shark Attack! unlocks a free companion digital component offering fun quizzes to test understanding, make and do activities such as build-a-shark-habitat, and great videos for an all-round ocean experience! 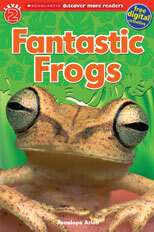 Developing readers hop into the world of amazing amphibians with FANTASTIC FROGS. How do frogs' bodies work? How do frogs behave, and why are they so important to our global ecosystem? All of these questions and more will be answered for budding herpetologists. A companion digital book poses evidence-based questions through mapping and charting interactive features, videos, quizzes, vocabulary "slams," and "Serious-or-silly?" writing activities. Fantastic Frogs unlocks free companion digital activities offering fun quizzes to test understanding, make and do activities such as create your own frog hand puppet, and great videos for an all-round froggy experience! This book combines appealing natural history facts about dolphins' anatomy and life cycle with new information about their behavior. There are charming stories about how dolphins interact just like little kids do—caring, sharing, and sometimes disagreeing! 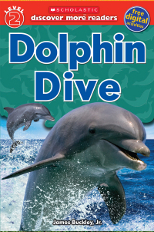 Dolphin Dive unlocks free companion digital activities offering fun quizzes to test understanding, make and do activities such as create your own leaping dolphin, and amazing videos for an all-round dolphin experience! Discover the coolest military vehicles from the air, land, and sea. Featuring some well-known vehicles and some you've never heard of at all, full-color action photos will engage the reader. Simple text, fascinating information, and large color photos throughout make this the perfect book for reluctant readers! 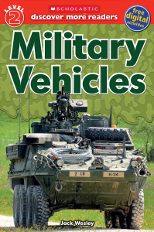 Military Vehicles unlocks free companion digital activities that offer fun quizzes to test understanding, cool projects like creating your own fighter jets, and amazing videos for an all-around military experience! 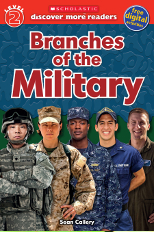 Branches of the Military unlocks free companion digital activities that offer fun quizzes to test understanding, cool projects like making your own military badges, and amazing videos for an all-around military experience! A chronological narrative of one of the most destructive storms in US history. Hurricane Katrina was one of the worst hurricanes the United States has ever experienced. At the tenth anniversary of this tragic event, this child-friendly account investigates the science behind the storm. A timeline of events describes the lead-up to the hurricane, the subsequent floods and subsiding waters, and the rescue operations. Heroes and survivors tell their own tales of the cleanup and rebuilding efforts, and discuss their hopes for the future. 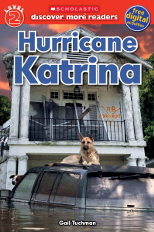 Hurricane Katrina unlocks free companion digital activities that offer quizzes to test understanding, projects like making your own hurricane in a bowl, and incredible videos for an all-around hurricane experience. Prepare to be scared! Come face-to-face with some of the world's most famous monsters and creatures: the Komodo dragon, giant squid, vampire bats, the Minotaur, Hydra, Bigfoot, and Yeti. Are they myth? Or fact? This Level 2 Reader explores the reality behind all of the most terrifying monsters. The book uses simple text and full-color photographs and artwork throughout. 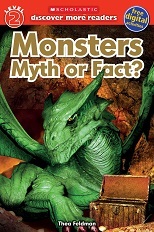 Monsters: Myth or Fact? unlocks free companion digital activities that offer fun quizzes to test understanding, cool projects like making your own flying dragon, and amazing videos for an all-around monster experience! The whole world is made of rocks! The Earth's rocky crust was formed millions of years ago, and its rocks are always changing. It is full of fascinating minerals, and we use its treasures in hundreds of ways. Did you know that toothpaste contains finely ground rock dust, that the stripes in the Grand Canyon's rocks were once layers of sand at the bottom of the sea, and that robots are examining the rocks on Mars? This Level 2 Reader teaches readers all about the different kinds of rocks and minerals, how rocks were shaped, how we use the Earth's mineral resources, and how we can unlock its fossil secrets. The book uses simple text and full-color photographs throughout. 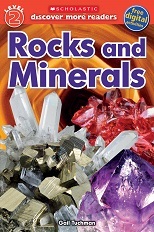 Rocks and Minerals unlocks free companion digital activities that offer fun quizzes to test understanding, cool projects like making your own rock museum, and amazing videos for an all-around rocky experience! There’s nothing more explosive than learning to read with VOLCANOES! 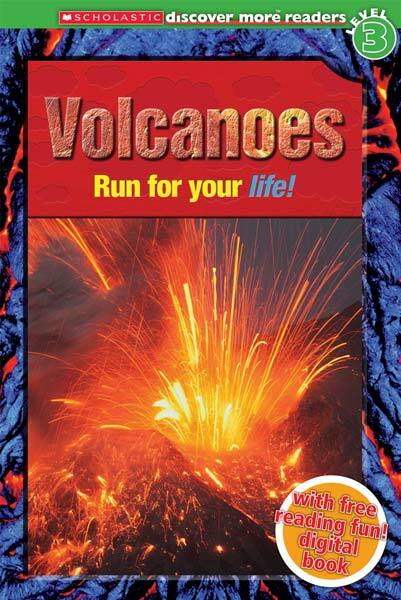 Venture into the Ring of Fire to explore volcanic activity with new vocabulary and information-reading features such as time lines, cause and effect, and eyewitness accounts. This action-packed Level 3 reader grows every kid into a mini volcanologist! Volcanoes! unlocks a free companion digital component offering quizzes and puzzles to test understanding, and fun things to do - make a volcano in your kitchen! Features awe-inspiring videos and places to go to discover even more. TITANIC tells the story of that terrible night through the eyes of Eva Hart, a seven-year-old girl who survived the sinking. Young scientists can examine the technology of the ship, and differing eyewitness accounts encourage readers to think about how history is created out of facts and opinions. 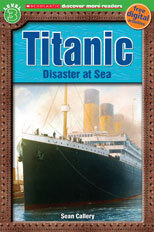 Titanic unlocks free companion digital activities offering quizzes and puzzles to test understanding, and cool things to do - make a 3-D Titanic scene! Features awe-inspiring videos and places to go to discover even more. Visit famous buildings on every continent in a best-ever world tour. In Europe, climb the Eiffel Tower, fight at the Colosseum, and lean with the Leaning Tower of Pisa. In Asia, visit the ruined city of Angkor Wat and the serene Taj Mahal. End up in the Americas amid Mayan ruins before traveling north to the Statue of Liberty and the Empire State Building towering over Manhattan. 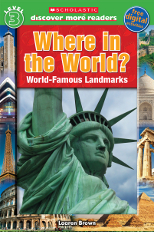 Where in the World unlocks free companion digital activities offering quizzes and puzzles to test understanding, and cool things to do — make a travel scrapbook! Features awe-inspiring videos and places to go to discover even more. While we at Scholastic attempt to provide links only to trusted third-party websites, please understand that we do not control the content on these third-party websites and that it is subject to change without notice to Scholastic. We therefore cannot be responsible for, and accept no liability for, any information or opinion contained on any third-party website.